If you're a fan of Pride and Prejudice, I'm sure by this point you've probably seen at least one of the trailers for the upcoming film adaptation of Seth Grahame-Smith's (2009) reworking of Austen's classic work. In fact, some of you may be skeptical of this twist on your beloved romance so carefully constructed by a woman, who one of my literature professors so fondly refers to as Aunt Jane. Yet this novel more than honors that work and storyline. You should indeed give this gem of a modern retelling a chance. 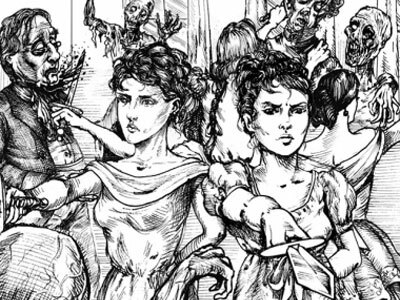 A Regency Era Zombie apocalypse novel is hilarious in all the ways you might expect. Mrs. Bennett is just as obsessed with keeping up appearances and finding her daughters husbands, but has the additional hurdle of Mr. Bennett insisting that his daughters be trained in the art of Japanese warfare to battle the so called "Unmentionables." Elizabeth is just as headstrong as ever, further empowered by her training. Grahame-Smith's additions further enhance the tension between Elizabeth and Darcy. For example, his notorious first proposal takes place as Elizabeth grips a katana, intent on defending her family's honor from his earlier slight of etiquette. In fact, the image below depicts Darcy's first impression of Elizabeth and her sisters. Although things are indeed different, a zombie slaying wife is still slightly undesirable. One of my favorite changes to the novel is Elizabeth's eventual battle against Catherine (who is a renowned master warrior) and her own fleet of ninjas that results in her union with Darcy. How cool is it that the traditional idea of the duel for one's hand is reversed? I will unashamedly admit that this book is what first piqued my interest in Jane Austen. As a young teen, Jane Austen was sort of my guilty pleasure. I watched film adaptation of Pride and Prejudice (starring Keira Knightley) with my mother and enjoyed it to some extent, but it felt too stereotypically girly for me. As a senior in high school, I discovered this zombie filled gem of a novel and its prequel, Dawn of the Dreadfuls. It is just as enticing as the original (It is authored by Steve Hockensmith as Grahame-Smith was busy writing Abraham Lincoln: Vampire Hunter). 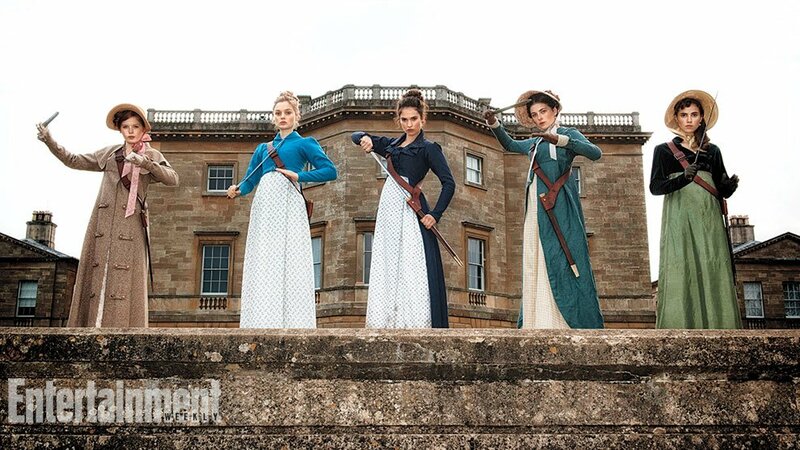 It details the girl's training (which partially took place in Japan) as well as some of their earlier adventures that lead up to the events of Pride and Prejudice and Zombies. In any case, I loved it. I went on to actually read Austen's original works afterword and quite enjoyed them. I have a hunch that I'm not the only girl (or guy) that had this experience. I indeed hope that the film adaptation brings this experience to many more individuals. On top of that, this novel getting a film adaptation (produced by Natalie Portman I might add) is a dream come true. This could very well be the BA chick/action flick I and so many others have been waiting for. The way Grahame-Smith portrayed the Bennett sisters as warriors was truly strong and independent. I'm hoping these new Bennett ladies of film will go down in history as heroes along the lines of Imperator Furiosa (and will provide amazing cosplay opportunities). If you remain unconvinced or still feel miffed at your favorite literature's soil being trod on just you wait. Dare I say that Grahame-Smith's Monster Hunter Darcy is even more attractive than the original. Just in case you haven't seen it, here's the trailer in its full glory. Have you read this, or other adaptations (like Sense and Sensibility and Sea Monsters)? What do you think of the trailer? What are your hopes for the film? 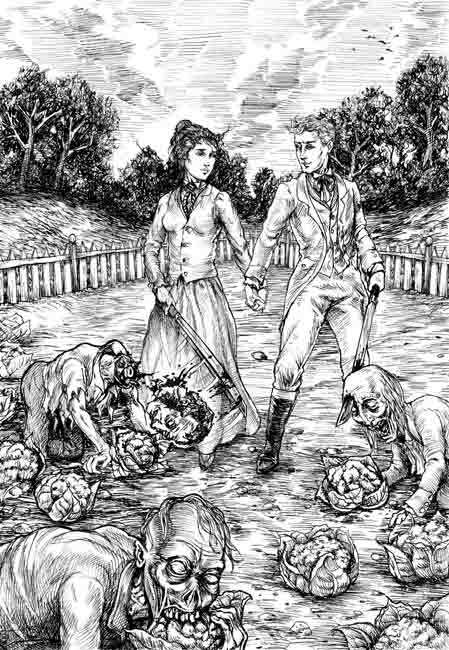 I read Pride and Prejudice and Zombies earlier this year, and thought it an interesting twist on P&P. I'm definitely curious to see how they're going to translate onscreen (the tone of the trailer strikes me as darker than the book), but it does look like a fun action movie! I AM SO EXCITED FOR THIS MOVIE I CANNOT EVEN SAY THE WORDS. Plus I love the Darcy they cast. I LOVE HIM. I am so excited. Like, usually Pride and Prejudice does not excite me but THIS made me really start to love the story. It is the best!